As we were leaving a friend’s house the other night after dinner and a game of Scrabble, she opened the freezer near the front door of her house (up here lots of people keep a freezer in their “kunnituck”–the front mud room). “Here! Have some moose meat!” She put a two-pound roast and a package of ground moose in my hands. We’ll save the roast for daughter Maia’s visit in December. But the ground moose… I knew right away what I wanted to do with that. There’s some debate about whether or not lasagna is lasagna unless there’s ricotta cheese in it. Bush Alaska ain’t for purists. 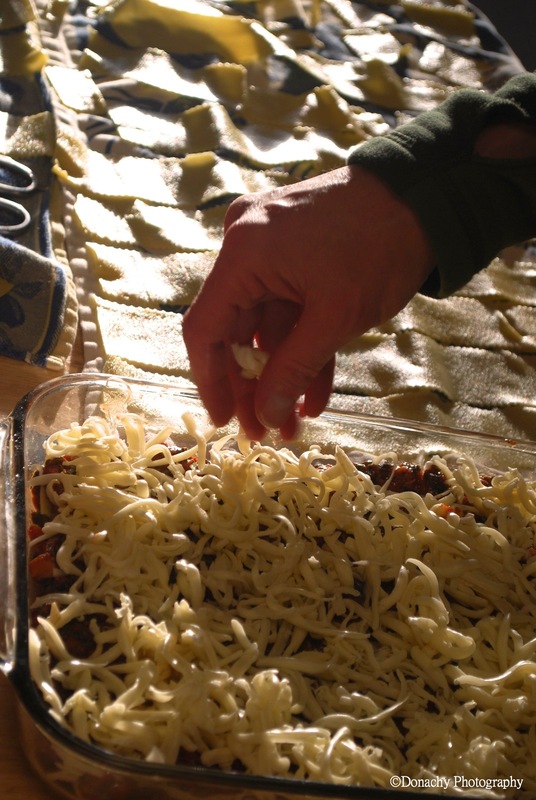 With plenty of mozzarella and parmesan on hand, we set about making our own version of Bush Lasagna. Tomato paste, diced tomatoes, garlic, onions, spinach (frozen), Italian herbs, ground pepper and olive oil laid down in layers amidst freshly made pasta and finished with a final layer of mozzarella, sprinkled with parmesan and topped off with Kalamata olives. Two big pans–one for now, one for the freezer.